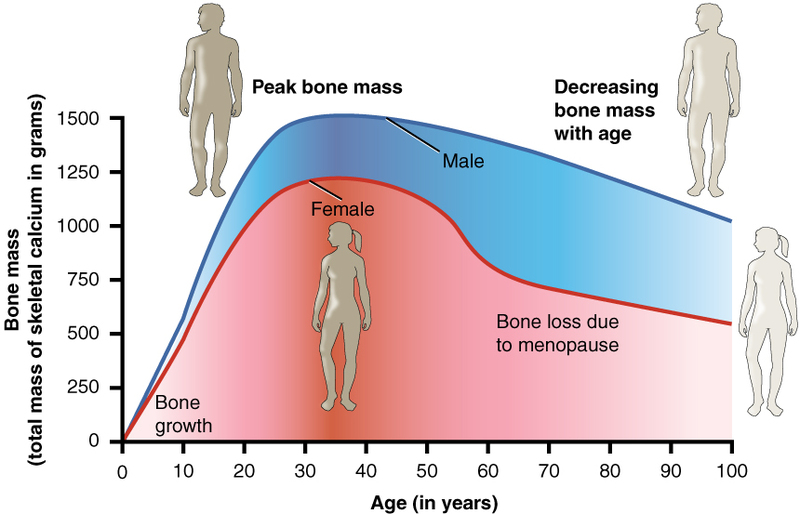 As one ages bone density decreases, especially for women past menopause. This lowered bone density may be classified as osteoporosis if it is severe enough. Osteoporosis puts seniors at an increased risk of broken bones after slips and falls which would otherwise cause no serious injury. The problem with osteoporosis is that there is usually no way to physically tell that you suffer from lowered bone density until a break or fracture has occurred. A bone density test will help diagnose whether you have osteoporosis. Unfortunately it is not a test routinely performed until the age of 70 for men and 65 for women. The exception is if a bone break after age 50 occurs. The most common test for osteoporosis is the Central DXA, which stands for dual energy x-ray absorptiometry. The hip or spine is exposed to x-rays and the amount of x-rays that pass through are measured. The less dense the bones, the more x-rays pass through, and the machine determines your bone density. In order to prevent osteoporosis, women and men over the age of 50 should consume 1,200 mg of calcium per day and at least 600 IU of vitamin D to help with calcium absorption. The best way to get these nutrients is through the consumption of vitamin D fortified milk. The calcium in milk and other dairy products is great because it is readily absorbable by the body. Three glasses of milk per day are adequate and split up the dose so that your body can better absorb the calcium within. Supplements are another option for calcium and vitamin D, but not all supplements are created equal. Formulations of calcium in the form of calcium citrate with vitamin D are best. Just increasing your intake of calcium may decrease bone density loss, but it will not strengthen bones by itself. In order to do this, weight bearing exercise is needed. A synergistic effect takes place where the body’s need for calcium is satisfied by the availability of calcium within the blood stream. Exercise stimulates the building of bone tissue and therefore the need for calcium. Walking or light jogging is an example of a popular activity that can help you increase bone density. Light weights can be added to each hand in order to increase resistance. If a diagnosis of osteoporosis has been determined, a medication may be prescribed in order to stop further weakening and prevent a life threatening break. Typically a biphosphonate such as Fosamax, Atelvia, Boniva, Reclast, among others, is prescribed. They work by limiting reabsorption of bone minerals. Your doctor will monitor your progress and test your bone density along the way. Medication combined with diet and exercise can be effective in treating osteoporosis and preventing broken bones. *Please use the age and bone density chart below for reference.